The Cool Water Woman by Davidoff for Women provides a hauntingly romantic scent that is composed using calm aquatic notes. This Eau de Toilette is released ten years after the successful launch of Cool Water for men. This scent has been created to remind us of ocean breeze and cool sea water. The top notes are composed of luscious pineapple notes that blend perfectly with quince, black currant, lily, melon, lemon, lotus, and calone, to provide a mesmerizing essence. The core of the scent consists of honey, hawthorn, jasmine, water lily, lily of the valley, lotus, and rose, that together provide a sweet floral aroma. The base is comprised of blackberry, violet root, sandalwood, musk, raspberry, vanilla, peach, and vetiver. This Eau de Toilette is contained in an elegant looking flacon and is available in a quantity of 100ml. Reputed perfumer Pierre Bourdon concocted it in 1996. 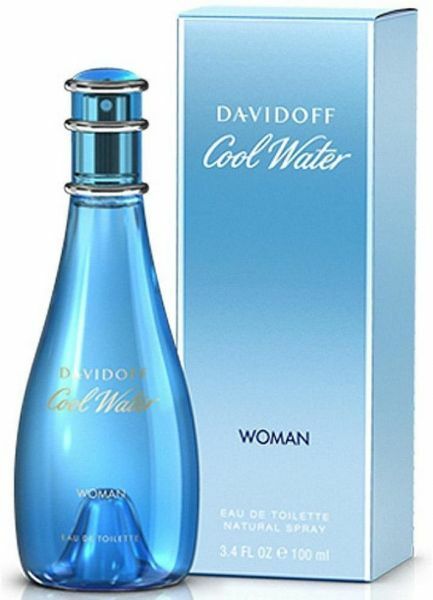 The Cool Water Woman by Davidoff for Women starts off with a beautiful blend of fruity floral elements. Juicy, fresh accents of pineapple, quince, black currant, melon, lemon, and calone coalesce with the floral notes of lily and lotus to form a delightful start to a wonderful scent. The heart of the Cool Water Woman by Davidoff for Women Eau de Toilette is dominated mainly by floral notes. The accents of jasmine, hawthorn, water lily, lily of the valley, lotus, and rose combine with an essence of honey, to illuminate the entire composition of this Eau de Toilette. The foundation of this Eau de Toilette is composed using a combination of floral and raw, woody notes. Elements of blackberry, violet root, sandalwood, musk, raspberry, vanilla, peach, and vetiver coalesce to provide a romantic aroma. 94.4% of users recommend this product to a friend. Genuine & very fast shipping. Love this scent, refreshing, light and not overpowering, perfect for summertime.